When we started the Old Town Crier thirty years ago, after each month’s delivery, we had a few days to take a break. These were mostly day trips although sometimes it was not advisable to drive back that night. One of our favorite destinations was the West River and the restaurants (bars) of Swamp Circle Saloon, Steamboat Landing (now Thursdays) and Pirates Cove in Galesville. These were great adventures back in the day, so we decided to make a return trip but also to include Skippers Pier in Deale, another favorite. Things have changed somewhat from those days. There is a lot more traffic out that way as more people have moved to this beautiful area. It is still a step back in time. Back then you could buy the house a drink at Swamp Circle Saloon for $20. You could get three plays on the jukebox for a quarter and they were all 45’s. They had a real dart board and an air conditioner in the wall that would blow out a little fog on hot days. The Circle is closed now waiting to be transformed into a Mexican place, but the last time I was there they had an electric dartboard, CD jukebox and central air. The drive is still the same as I remember. As soon as you got off the main highways the heat from the road faded as treelined single lane roads provide shade from the sweltering summer sun. The road-side stands where you can buy fresh vegetables, fruits and that Maryland original…Silver Queen…corn are packed with produce. Now is the time folks! This is a boating mecca along the West River and its little coves and points. Back in those days Herrington Harbor in Deale had about 150 boats. Today I guess that they have over 1,000 boats…mostly sail and averaging 35 feet. Hartge’s Yacht Harbor in Galesville is an institution. It is still one of the premier places for “Slips, Service and Serenity”. They actually did some work on my boat several years ago. As I mentioned earlier, a lot of people have moved to the land of pleasant living over the past 30 years. Wendy Rieger, who is our Personality Profile this month bought a bungalow, circa 1920, years ago at Chalk Point and loves her view on the West River. Across the West River is Pirates Cove, a favorite dining spot for Rieger and is our first stop on this road trip. The correct name is The Inn at Pirates Cove. Not only is it a great and roomy restaurant with an out- door bar area, but it also has a small cluster of rooms for rent. This option was a blessing some 30 years ago when then bartender Joe Williams recommended that we not drive back but rather spend the night. That was good advice. 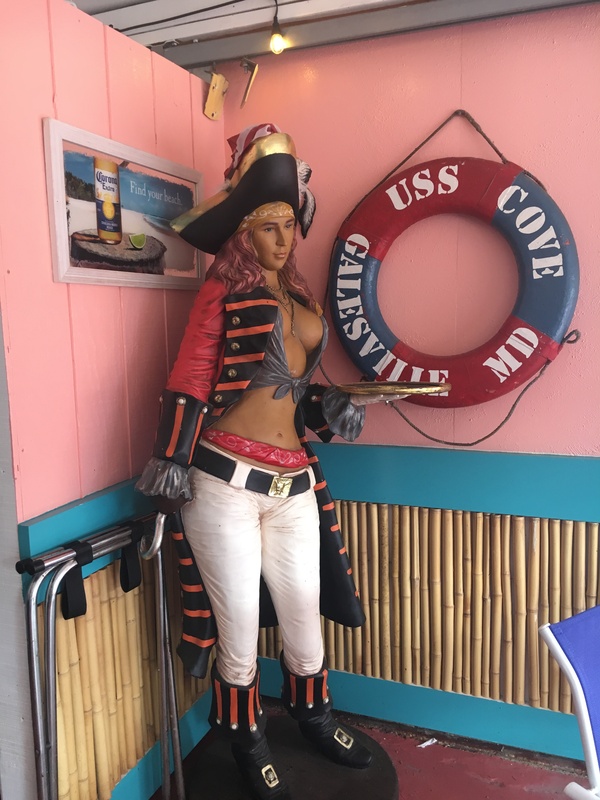 Pirates Cove is in the quaint town of Galesville, which has a rich history and character dating back to 1652. Pirates Cove Restaurant was established in 1960, and in 1984 Bob and Theano Platt began creating the Pirates Cove we have come to know today. Whether your preference is indoor dining, sitting along the water on the dock, this place has it all plus great food. Our favorite is the Dock Bar. Situated alongside the restaurant and under the Inn, the Dock Bar is certainly a local favorite gathering place. Local musicians preform there on weekends and chances are good you may find our friends The Eastport Oyster Boys performing on special occasions. The L-shaped bar can accommodate a number of patrons while there are numerous tables scattered about for casual use. The bar has a great view of the boats that call this home and the transient sailors looking to quench a thirst. The place is well run and all the wait staff and managers we met were terrific. Our bartender this month works there. Next to Pirates Cove is Thursday’s where Steamboat Landing used to be years ago. This is a restaurant that is built out over the water making for 270 degrees of water views. The inside bar looks like it was imported from D.C…. dark woods everywhere. The sign says crabs and steaks and this place has both. The picnic tables are a perfect spot for that crab feast and cold beer and of course…silver queen corn on the cob. 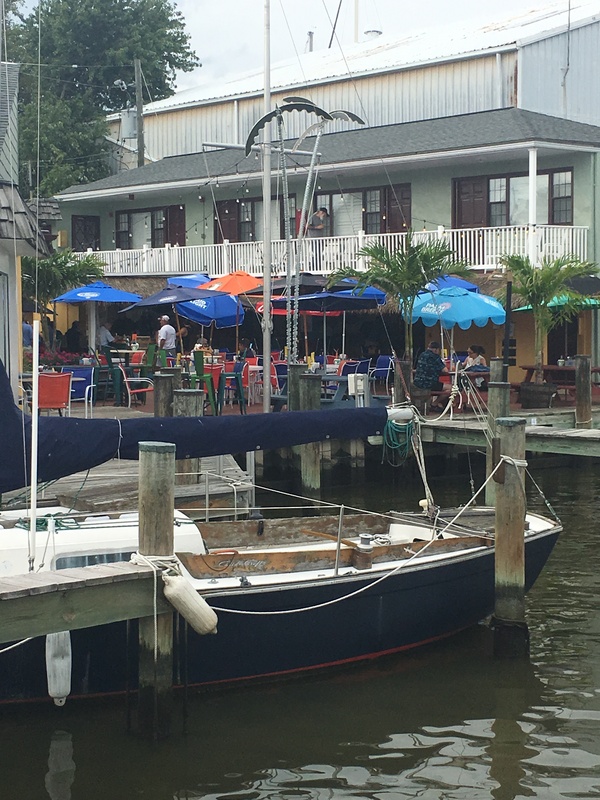 The outdoor bar is a great place to unwind and watch the boats come in from a day on the West River or Chesapeake Bay. Leaving Galesville, you can make a left on Muddy Creek Road (468) and travel past some beautiful horse farms to Swamp Circle Saloon. As I mentioned it is closed awaiting a new tenant. Continuing down the road to route 256 take a right towards Deale. Plug in your GPS and locate Skipper’s Pier. You will travel through small neighborhoods to get to this iconic place. Thirty years ago we didn’t have GPS, so it took a little effort to find it…we had a real map. In my day it was one building with a covered bar out on the pier. They had a toy train set up that ran from the kitchen, through the wall and behind the bar. That is how the kitchen would send out the sandwiches. Today the set up is larger. They have added on to the restaurant for more dining possibilities. 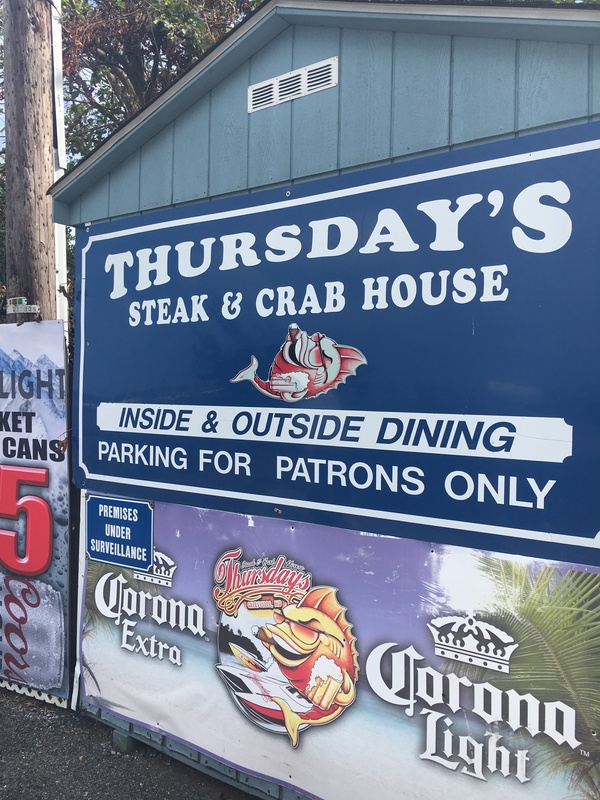 Like Thursday’s, they also offer steamed crabs. What once was an oyster processing plant on Rockhold Creek is today a first-class dining experience. They have an extensive menu covering it all from steaks to seafood to sandwiches but still the water beckons and we took a seat at the dock bar. The U-shaped bar looks directly out on the creek ad passing boats with an occasional one tying up at the dock looking for an empty table. These water side bars are where you can lose the day to pleasant thoughts. The food is downright Maryland delicious and the people are an interesting lot. There is no pretense here, you must come in your big boy pants. The coming month is the best time to visit these establishments. 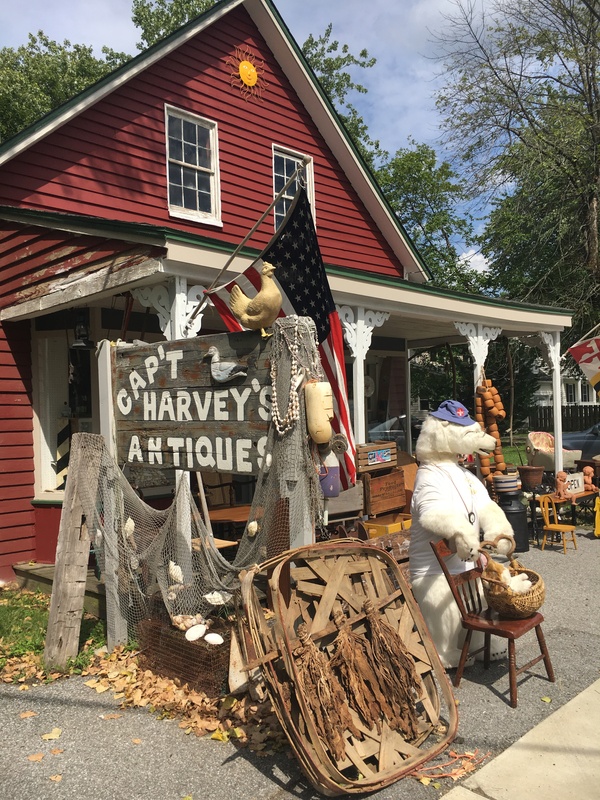 In addition to the road side stands, restaurants, bars and boatyards, there are some very interesting antique stores in both Galesville and Deale. My traveling companion was enamored with the Cap’t. Harvey’s Antiques in Galesville. You have to see this place to believe it. The summer heat is fading, and the wind is rising which will make for great sailboat watching and sailing. See you by the water.